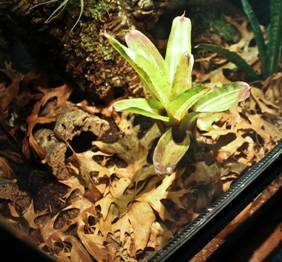 Turn Your Reptile Terrarium into a Vibrant, Natural Vivarium! I have kept reptiles and amphibians for the past 8 years. As a result, I have maintained many different kinds of set ups. A few months ago, after visiting some friends and checking out their collections, I couldn’t help but notice how many all-natural vivariums they had. Their animals seemed much more active and the vivariums themselves were a visual addition to each room. The most shocking revelation was their ease of maintenance after the initial start up. If set up properly, the vivarium becomes a self contained ecosystem that requires minimal upkeep compared to other caging methods. I had to try! From here on, I can say with confidence that I will always keep my reptiles in as naturalistic an environment as possible. The following is my regimen to setting up a successful, naturalistic vivarium for reptiles or amphibians. When dealing with the live plants of a vivarium, airflow and a higher ambient humidity is important. If you do not have enough airflow, you will soon find your vivarium plagued with mould and an undesirable odor (trust me). This can lead to respiratory problems or other illness in your animals. But don’t get too much! Too much airflow will dry out your vivarium, resulting in desiccated plants and potential respiratory problems in your pets. There are many reptile enclosures that have ventilation built into their design. Make sure the enclosure you purchase has venting at the substrate level of the reptile tank as well as at the top (i.e. terrarium screen top) in order to promote circular airflow. Many such terrariums are readily available for a relatively low price. If your vivarium is still drying out too much, use something to block some of the ventilation at the top of the tank (i.e. Cling Wrap). 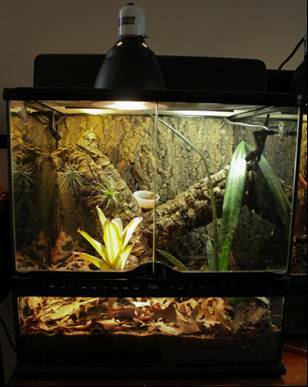 I have also found it very useful to have three sides of the vivarium completely opaque to make the animals feel secure. When your animals are more secure, you will see them more, as well as more of their natural behaviour. Some materials also help with humidity. ZooMed Cork Tile background inserts fit most common sizes of their Naturalistic Terrarium line. These work well in other enclosures with similar dimensions. The cork absorbs humidity well, releasing it back into the environment when it starts to dry out. As an added benefit, these backgrounds serve as great mounts for epiphytic plants. If you plan on using live plants, you MUST PROVIDE DRAINAGE! Many plants of the rainforest live in surprisingly dry soils because there are so many organisms, macro and micro, competing for any available water. A drainage layer comprises large granular pebbles or pellets that are underneath your actual substrate or soil. It prevents the soil from becoming saturated with water. For plants, saturation can cause water-stress, which is just as detrimental to plant welfare as not having enough water. For my drainage layer, I use ZooMed Hydroballs, which are expanded clay pellets. About an inch thick layer at the bottom is sufficient. I prefer clay because it is lightweight and allows places for beneficial bacteria to grow. Also, it lets plants grow along the water table. After your layer of Hydroballs, you should place a sheet of lightweight, non-toxic mesh to separate your drainage layer and substrate. You can get this kind of inexpensive mesh from a hardware store. Once the mesh is in place, you are ready to add your planting substrate. Make sure you are using a reptile substrate made of organic matter if you want your plants to flourish. It is CRUCIAL that the substrate you use is not enriched with ANY kind of fertilizer. I took the guess work out of this step by making a 1:1 mixture of Zilla Jungle Mix (Fir and Sphagnum Peat Moss) and Exo Terra Tree Fern substrate. I put about 2 inches of this mixture on top of the drainage layer. This made a very naturalistic looking substrate that is very high in organic matter. When broken down by bacteria and other organisms, this substrate will be available to your plants as food. I have found the jungle mix and coconut husk substrates to have lots of little invertebrates called springtails in them. Springtails are fantastic decomposers and food for smaller animals. They look like little white shrimp that bounce around the substrate. If you see something that fits that description bounding around your soil, RELAX. For additional natural decomposition, I go to my local bait shop and pick up a couple of small earthworms and pill bugs to throw in the substrate. These inverts serve as your clean-up crew – essential to cycling nutrients and making them available to your plants. While some consider them controversial, I have used clean-up crews in all my vivariums. Even the most sensitive plants I have in there (Dwarf Bromeliads) are flourishing. These guys will decompose your animal feces and dead plant matter. This process makes nitrogen available to plants, which when in low abundance is VERY growth limiting. On that note, I also make sure to provide a layer of sterile dried oak leaves to serve as decomposer fodder and hiding places for small terrestrial animals. 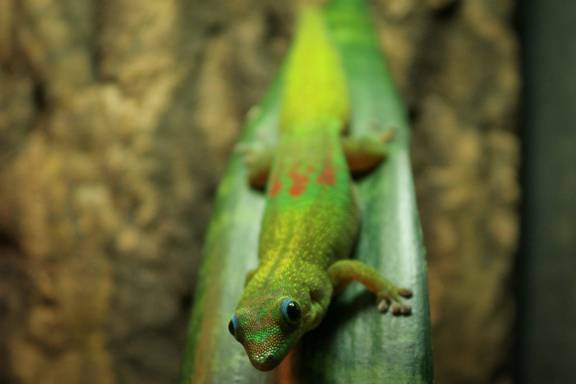 This also adds a very naturalistic flair to your vivarium (it looks awesome!). Plant selection is very similar to animal selection in that some species can grow under any conditions, while others seem to wilt if you look at them wrong. Your choice of flora completely depends on how large your enclosure is, what animals you are keeping, your lighting, humidity, temperatures, and the list goes on. Make sure you thoroughly research the environmental requirements of ANY plant you buy to make sure you didn’t just waste a fair chunk of change on something soon to be compost. Also it is very important to make sure your plants are animal-safe. Like the animals themselves, plants are living creatures that can defend themselves, some more viciously than others. So again, make sure you research any plant you purchase thoroughly. I have a few recommendations for plants that are hardy and animal safe: Bamboo, Sanseveria, Pothos, Spider Plants, Cat grass, Dwarf Schefflera, Ficus, and Peperomia. All of these plants are good to include in your first vivarium as they are probably some of the easiest to cultivate, especially Pothos species. Stay away from Mosses, Bromleliads, Tillandsia, Violets, and Orchids until you have kept the beginner plants for a while and understand plant husbandry. It takes a lot of trial and error to really understand horticulture in the terrarium, as it is very different from herpetoculture (keeping reptiles and amphibians). Plants are half of the fun of vivariums and choosing the right species is paramount. Since you are growing plants, you’re going to have to make sure that you have full spectrum lighting. Which full-spectrum light you use is up to you. I have been using Exo Terra Repti Glo 2.0 to great success. It has a Kelvin temperature of 6,700 K, which means it is a fairly white light, making it visually appealing. It also produces a spectrum of light called UV-A, which reptiles and amphibians can see in. Some speculate that UV-A can aid in promoting breeding and other natural behavior. A 2.0 bulb does not produce sufficient UV-B rays for reptiles, so you’ll have to throw an Exo Terra Repti Glo 5.0 bulb on the vivarium as well. This ensures your reptiles metabolize enough vitamin D3 to prevent metabolic bone disease. That is a very brief, but sufficient guide to getting your own naturalistic vivarium up and running. Vivariums do cost a little bit more to set up in comparison to simpler systems, but they seem to take a lot less effort to maintain in the long run and look much, MUCH more appealing. All of the products I mentioned above are readily available at Homes Alive Pets in the reptile products section online or in-store. This article was written by a former employee and customer, MIke. 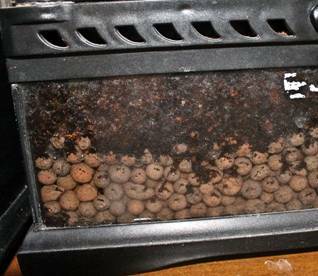 Mike says "This is an account of how I set up MY naturalistic vivariums. It is by no means definitive or the only way, just the methods that I have found the most effective after much trial and error (emphasis on error)."